Is destroyed by Lil' XT and Landro's Lil' XT. Am I the only one that finds it amusing that this pet has a little eagle head- type thing on it and a move called 'Shock and Awe'? I use this guy on my A team. His ability to pack a devistating punch is benificial on any team. Great battle pet. Great pet vs. Little Tommy Newcomer on Timeless Isle. Start with Ion Cannon. You can't perform any actions for two rounds, but it doesnt matter, because you will be swapped out to another pet. While your second pet battles, your Tonk will recharge. 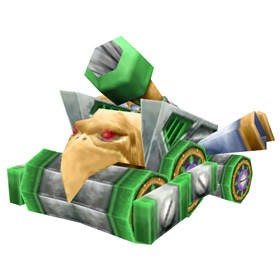 After second pet dies, (I use rocket bots) switch Darkmoon Tonk back in. now cast Shock and Awe, 25% chance stun. If u can cast Missile w/o dying, cuz u stun him, then do so, otherwise cast Ion Cannon again. Not a bad pet for a beast battle. Is it just me or does the look of this one remind anyone else of Luigi in Mario Kart? A truly solid pet, very close to the top tier. Missile damage is ok, if you want to screw with fast pets use Charge instead. Shock and Awe has a nice chance to stun, but Minefield is truly a powerful move. In the last slot I prefer Ion Cannon, Lock-On is a bit clunky. With over 1600 health, mechanical racial and powerful moves like Minefield and Ion Cannon you can't go wrong with this pet. Just watch out for elementals, they can really chew you up. 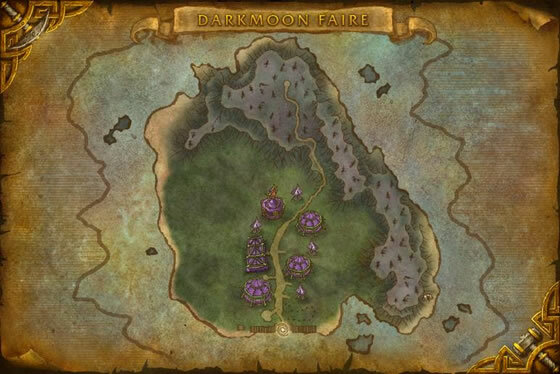 I dont know if this is still true but I got one of these little guys from the boxes they give you as a reward for the ticket dailies this was the second time they moved the darkmoon faire to the island. A surprisingly useful PvP pet if used with Charge+Minefield+Ion. The minefield does a lot of damage and discourages the enemy from swapping, Charge ensures you always go first (ruining any enemy abilities that rely on them being faster) and deals bonus damage against dragons, while Ion Cannon is a great finisher (for when your pet is about to die or it will end the match). In particular, you can often take out the enemy's third pet in a single round with Minefield (before it switches in) and Ion Cannon. This little tonk is one of my go-to guys when battling Master Pet Tamers. He's especially good on flyers and beasts. I have been known to threaten to buy 2 more at the Darkmoon Faire and set out with a whole crew of Tonks! I would rule the world! MWA-HAA-HAA-HA! A neat strat with this guy is save ion cannon for the last round as a execute type move, or use it when you know you are going to die as a suicide move to do massive damage, as the recharge will mean almost certain death anyway. This must be the doomsdaymachine Dr. Strangelove has us warned about... You are lucky to have one to win the shoot-out on doomsday with other doomsdaymachin owners! This guy is excellent for crushing beasts. Also, the Lock-On ability is able to target an enemy pet that is submerged or has lifted off, so you don't have to wait that extra round to set it up. Ion Cannon usually hits for over 1k on beasts, but you'll be vulnerable for a couple rounds if you miss or get dodged. A favorite of children across Azeroth, this tough little toy can withstand even the most aggressive imagination.